Croxx A Workshop is a multimedia workshop based in Hong Kong since 2010. We create our self-branded 3D Animations with combining our creativity and local culture of Hong Kong. Our team is energetic and well-equipped with creative thinking and technical skills. This bring us to be chosen as one of the participants of RTHK Animation Commissioning Scheme in 2 consecutive years. Our services includes 3D/2D Graphic, Video Production, Motion Graphic and Multimedia/E-Commerce Solutions. We Won Our First Animation Award! 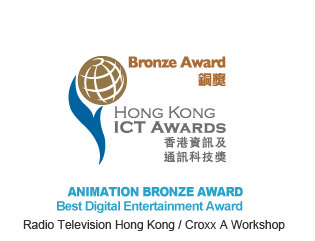 We are proud to announce our animation "Dream Daily" have won the Best Digital Entertainment Award - Bronze Animation Award of HKICT Awards 2012. The judging criteria include: Originality, Creativity, Entertainment Value, Technology, Business Potential and Social Impact.We are happy to win the Bronze Award from various entrants. It encouraged our team to create more high quality local animation! © Copyright Croxx A Workshop 2019 All rights reserved.